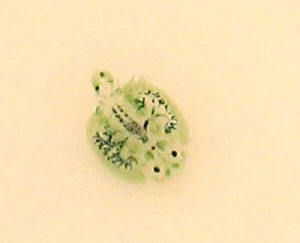 A fish louse... Argulus species. The Fish-Eating Filter 1.8.05 Hi WWM, <Hi! Ryan helping you today.> I have read over your site and found a few articles about fish meeting their end by getting sucked into their filter. From July until today I have had a total of three fish get stuck in the filter, a black moor (Buddy), a comet (Ace), and a calico (Daryl). We have tested the water for ammonia, nitrite, and nitrate, and our water is fine. All of our fish seem perfectly healthy and happy before they get "sucked". We have five goldfish (each about 1 and a half inches long) that live in a wide 30 gallon tank. We do a 25% water change once a week and we recently started feeding them gel food because of swim bladder disease caused by flake food. <Great move for overall health as well- Gel contains nutrients which would be destroyed by the drying process.> I was wondering if you could suggest what the cause might be and how we can fix the problem. <Id suggest using a sponge over the filter inlet. They make a variety of circular and tubular sponges for this purposeMany of which can be easily attached with a needle and fishing line.> I am very attached to my fish, and was very devastated when I woke up this morning to find Daryl stuck to the filter. I was also wondering if there is anyway to save a fish after being sucked. <A solitary area, typically called quarantine, would be in order. There, you could make sure hes eating, and not being harassed by his fellow tenants. You could also medicate the water in an effort to rebuild his damaged tissues.> Each of my fish are unique and have vibrant personalities, I just want to save my babies. <Youre on the right track- And you may want to consider adding a small powerhead once you make the sponge covering- It may reduce water flow. Good luck! Ryan> Please help! 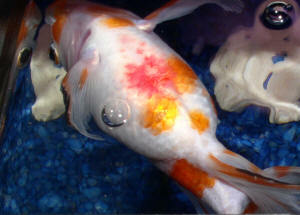 Goldfish problems :( Hi, <Hello...Jorie here> I've had a goldfish for a few years now, and he seems to be having a few problems. He tries to swims and moves his fins frantically. He gets off the bottom but when he stops he just goes straight to the bottom, and can't seem to get to the top. <Hmmm, could be swim bladder disorder or constipation. The former is a condition that can be caused from various things, ranging from bacterial to viral. You need to make sure your water conditions are near-perfect - what is your water change schedule like? How big is the tank he lives in, and how many other fish are in there? If adding more water changes to your regular schedule doesn't help, you could start a course of broad-spectrum antibiotics (only in a separate hospital tank, of course) in case the culprit is a bacterial infection. As for constipation, if that's what we are up against, you'll know because you won't see any feces from the fish. If this is the case, try adding Epsom salt to the tank and/or feeding a few frozen, then thawed peas.> He'll be alright won't he? Thanks for the help. Dan <I certainly hope your fish will be OK. Start off by doing some additional water changes, observe your fish closely, and progress from there. In any event, I would suggest separating him into his own tank for the time being, just in case this is something communicable. Best of luck...Jorie> P.S apart from that he seems fine.